Experimental Studies: Anesthetized dogs were subjected to a right then left thoracotomy. 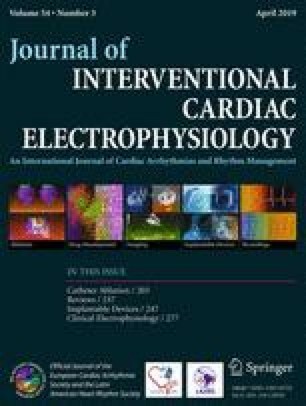 Two modes of electrical stimulation were used to activate ganglionated plexi (GP) on the epicardium of the atria: (1) Near the base of each pulmonary vein (PV), trains of high frequency stimuli (HFS) were coupled to each atrial paced beat so as to fall within the refractory period to achieve nerve stimulation without atrial excitation; and (2) Continuous HFS was applied via plaque electrodes sutured to epicardial fat pads (containing a GP) near the right superior (RS) and left superior (LS) PVs. The chest was then closed. An ablation catheter, inserted percutaneously, was positioned fluoroscopically in the right atrium across from the epicardial plaque electrode near the RSPV. Transeptal puncture was used to place an ablation catheter at the LSPV-left atrial junction. HFS applied to each of the epicardial fat pads induced atrial fibrillation (AF) and also caused high grade AV block due to a strong parasympathetic effect on the AV node. Radiofrequency ablation from the right and left atrial endocardium abolished the vagal response to HFS delivered to the plaque electrodes on the fat pads close to the RSPV and LSPV, respectively. Clinical Studies: Sixty (60) patients with paroxysmal or persistent AF underwent PV antrum isolation (27 patients) or PV antrum isolation plus left atrial GP ablation (33 patients). Endocardial HFS at the border of the PV antra near the 4 GPs produced AF and high grade AV block (vagal response) during AF. RFA at these sites abolished the vagal response. Testing in a small number of patients with very short follow-up suggests that adding GP ablation to PV antrum isolation may increase ablation success (absence of AF recurrence) from 70% to 91%. Conclusions: These basic and clinical studies suggest that localized cardiac autonomic ganglia (GPs) may play a critical role in the initiation and maintenance of AF.